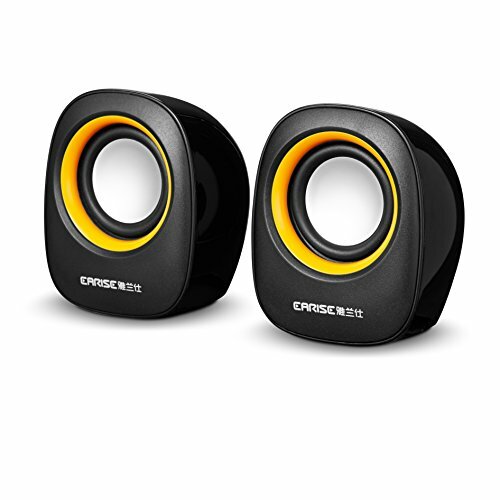 If you’re looking for a pair of speakers with acoustic quality stereo sound but easy to carry and not taking too much space on your desk. EARISE AL-101 will surely meet your needs! Note: USB and 3.5mm cables both need to be plugged. -Power supplied by Mini USB, no adapter or amplifier required. Simple design speakers, compact appearance and double Color match make it trendier and not boring. Acoustic quality stereo sound, let your room Filled with music, movies, or computer games and make you immersive. Portable independent volume control, cable length up to 55 inches, for quick and easy Audio adjustments. Plug and play, strong Universal compatibility, it fits most of now device. NOTE: USB and 3.5mm cables both need to be plugged. Holiday gift, home gift, a perfect gift for your family, lovers or friends. Shape chic and adorable size ideal for placing on table, especially for home, office and school.